The new university will steer HKUST in education, science and technology and knowledge transfer. According to a recent press release, The Hong Kong University of Science and Technology officially signed agreements today with the Guangzhou Municipal Government and Guangzhou University to establish Hong Kong University of Science and Technology (Guangzhou) (HKUST (GZ)), marking an important milestone in the University’s advancement. HKUST (GZ) will help steer frontier development of HKUST in education, science and technology, business and management as well as knowledge transfer, adding forces to Hong Kong and the Greater Bay Area (GBA) which are gaining traction in innovation. Located in Qingsheng, Nansha in Guangzhou, HKUST (GZ) is part of a modern high-end service area there, situating next to a high-speed rail station and occupying an area of 1.13 square kilometres. 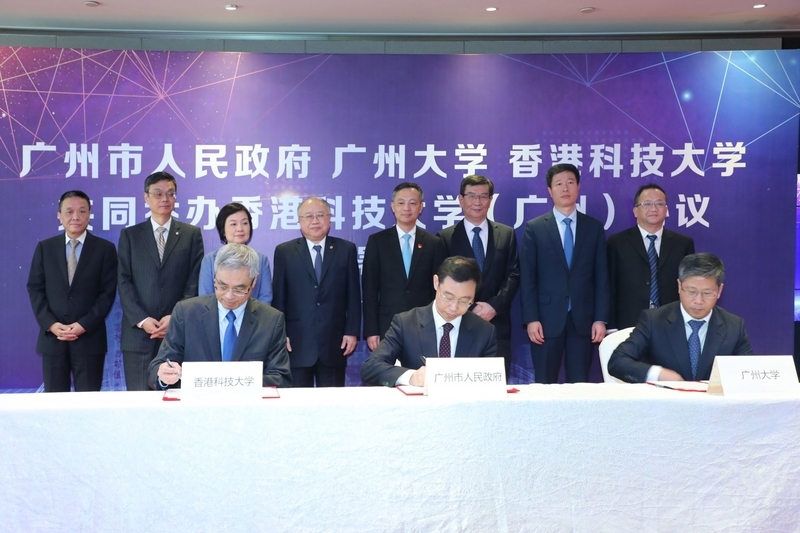 The collaboration agreements were signed by the Mayor of the Guangzhou Government, the President of HKUST, and the President of Guangzhou University. Witnesses to the signing included the Secretary of the CPC Guangzhou Municipal Committee, the Chairman of the HKUST Council and various other high-ranking government officials and academic leaders. Under the agreement, the Guangzhou Government agrees to fund the project’s entire construction cost, and subsidize the new campus’ future basic annual operating budget taking reference of the Hong Kong University Grants Committee framework. Meanwhile, HKUST will introduce its management model, teaching and research culture into the new campus to ensure it maintains the same quality and standard as its Hong Kong counterpart. HKUST will also ensure that the new campus’ facilities, design and planning comply with international standards. HKUST’s Council Chairman noted that the support of both Guangzhou and HKSAR governments is greatly appreciated and need; talent is key to GBA’s development into a global innovation hub. As an international research university, HKUST will be working with HKUST’s Fok Ying Tung Research Institute in Nansha and Shenzhen Research Institute to groom innovative talents with a global vision for the region. It is hoped that this collaboration could help enhance knowledge transfer in Hong Kong and address the city’s shortfall in the high-tech manufacturing sector, connect technology with business and create a new driving force for Hong Kong’s economy. HKUST President stated that all the parties share the same passion in turning HKUST (GZ) into a leading research university, progress against the foundation of a sophisticated global institution and enjoy academic freedom in accordance with the law. It was noted that HKUST (GZ) will maintain the same quality and standard as HKUST, the two campuses will be fully synergistic without overlapping academic structures. With the new campus located next to the newly planned high-tech park in Guangzhou, HKUST students could better transfer their research achievements and innovative ideas through the established industrial chain there. Students from both campuses can also share each other’s laboratories and research facilities. The exchange will be beneficial to the science and technology development in both Hong Kong and the region. According to the agreement, the new campus will adopt English as the basic language. Only postgraduate students will be admitted in the initial phase, with admission size eventually growing up to 4,000. The Senate of HKUST will be responsible for setting teaching principles and curriculums of HKUST (GZ), ensuring that the quality and policy are the same as those developed and treasured since HKUST’s founding. The curriculum will take into account international trends and the needs of GBA, with emphases on interdisciplinary subjects. The parties have started preparatory work on areas such as academic planning, institutional structure and campus design and development. HKUST will work closely with Guangzhou University to launch the application in a timely manner and obtain necessary licenses from various mainland authorities.